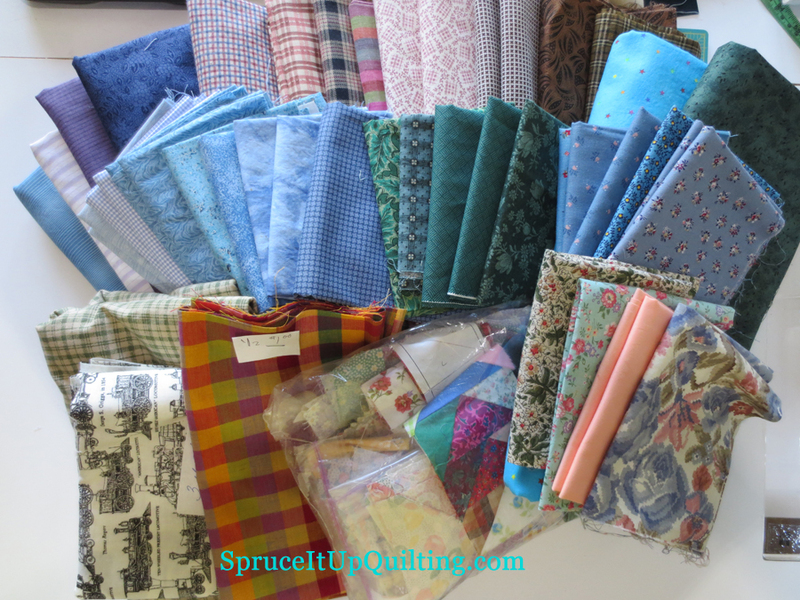 Spruce It Up Quilting: Glad for plaids! A couple of finishes in a couple of days... first off is the second of the baby quilts. I used the green fabric in the borders of the previous quilt for its binding and there was nothing left of that fabric so the striped lighter green was used for this one's borders. It makes this quilt look "lighter" which is what I hoped it would do. Another choice was to change the middle blocks strip color placement. This quilt was quick to make, about 5 hours from cutting to done! 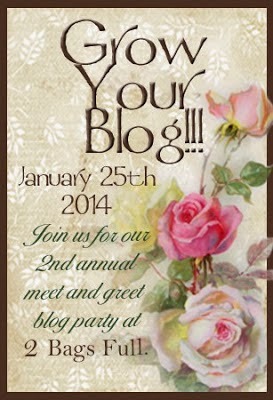 This next one has been a work in progress for several months. 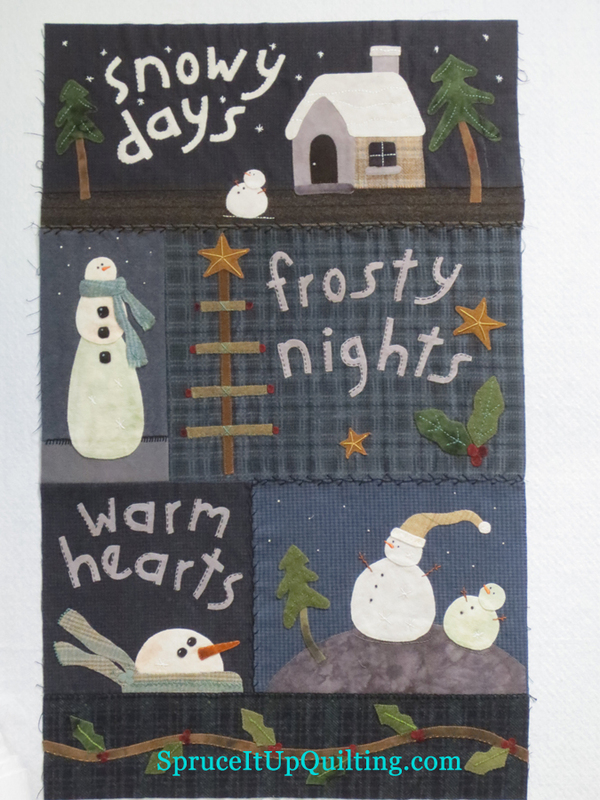 I completed the last of the embroidery today after the blocks were sewn together. 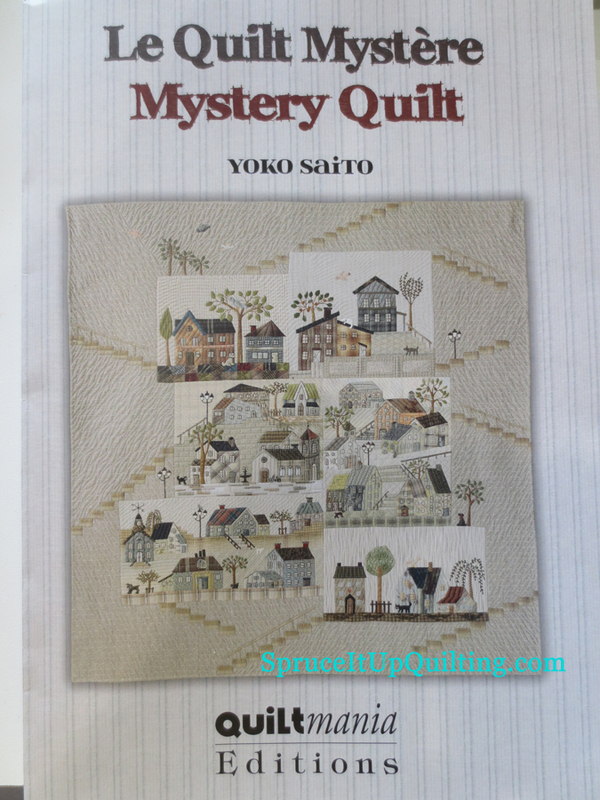 It'll be a quick one to quilt unless I use big stitch quilting by hand instead of quilting it on Lolah. 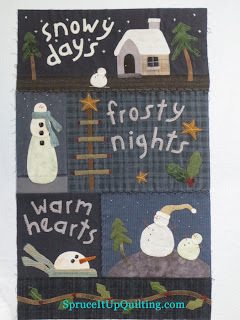 It's a wool applique pattern by Primitive Gatherings which I fell in love with at Road to California quilt show in January. Who doesn't like a snowman?? Some of these have enough yardage to be considered for backings. 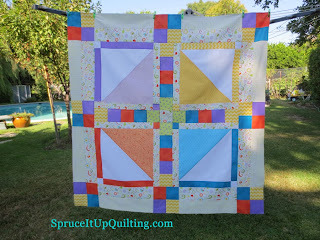 I'm liking that pale blue with multicolored stars as backing for one of the baby quilts. There's 6 yds of that one; the whole top row has a lot of yardage. Lots of plaids!! And the bag contains someone's left over blocks... enough for fun mug rugs. Hand projects for evening stitching are getting scarce so I thought I'd contemplate making this one... 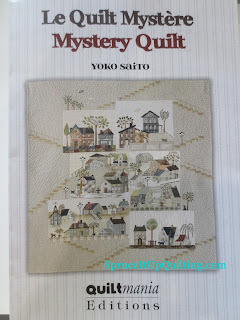 I just LOVE this art quilt... perhaps it's because of the taupe color?? Could it be because of the plaids?? And when both are together in a quilt my heart sings! In any case, my stash has so few taupes and the plaids I have are all darker than these. What's a girl to do? ?